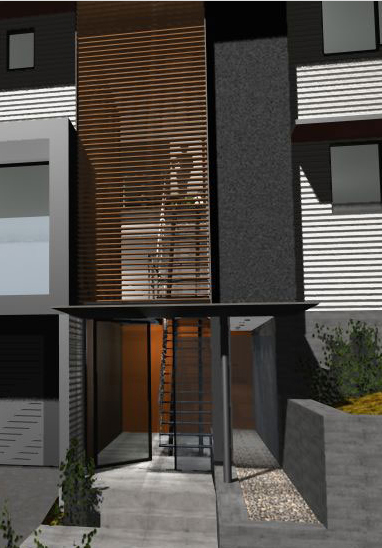 Floor_Too_High is a design proposal for a renovation of an Oakland home on a steep sloping site. A surveying error in the original construction resulted in an extra floor being added, raising the structure to enable the main living area to address the upper grade and the rear garden. This Floor_Too_High resulted in a larger square foot home, with a generous extra second floor space. An existing long outside concrete entry stair is used to arrive at the third floor front door. The renovation plan is to bring the entry into the home at the ground level. A new staircase slices the center of the house. This allows the movement to the upper floors to be an intregal part of one's experience of the house and offers dramatic views through the glass-floored stairwell. The large second floor space is converted to a home office with a private entrance for the designer clents. This work area is denoted with a strong framed front deck projection on the front elevation. Unused spaces below the floor plates are utilized to still provide 3 bedrooms and utility rooms. A new walk from the street to the entry is added through a revitalized front garden. Privacy walls seperate the entrance from the frontal garage and the side stairs to the new office area.